Welcome to Eastside Harvest House, a new home designed to harvest food, sun, and rain on site. 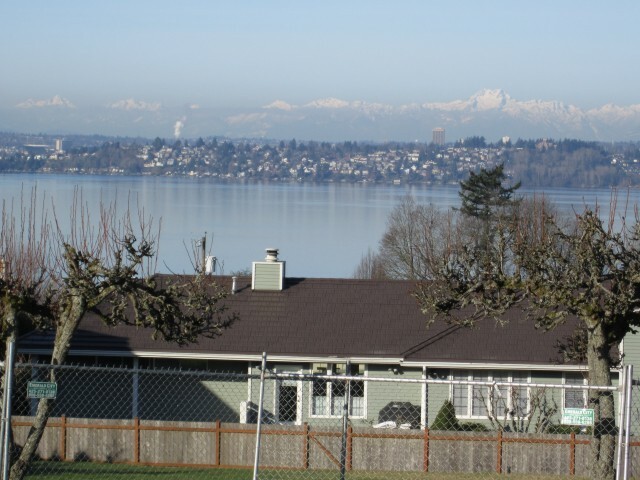 A Kirkland couple seeking to build their new home had three main criteria for their site: ample space for an edible garden, room for elderly parents to live comfortably and share their home, and enjoying a sweeping view of Lake Washington and the Olympic Mountains. They found a 1 acre dream site in the heart of Kirkland, largely undeveloped, with sweeping views of lake and mountains to the west. The house is a 5 minute walk to grocery stores, coffee shops, retail, and restaurants. There is a bus stop right at the street with service every 15 minutes to Kirkland, Bellevue, or Seattle, enabling car-free living. The site will boast an abundant 6500 square foot garden for the owners to grow their own fruits and vegetables. Irrigation will be provided by a subsurface drip system to irrigate two dozen raised beds, a dozen fruit trees, and numerous edible berry bushes. A basement root cellar will store the garden bounty and ample kitchen counter space will enable home canning in season for personal use or to give as homemade gifts. 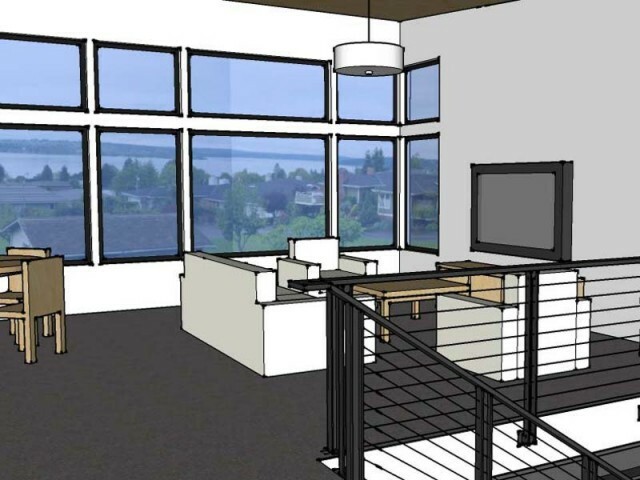 This 3500 square foot single-family residence will be divided into two suites, each with its own kitchen. The master suite will group the living, dining, and kitchen in one great room with a master bedroom and bath, a guest bedroom and bath, his and hers offices, and an exercise room. The private in-law suite will have a smaller great room, with two bedrooms and one bath. The floor plan allows for long term flexibility depending on the occupants. The wall dividing the great rooms is structurally designed to allow connection as one single dwelling, perfect for a large family with the in law suite becoming the children’s wing. But the wall can subsequently be divided again in the future to suit two smaller families. The house will be one story over a full daylight basement to fit it into the gently sloping site. An elegant stair will connect the two levels. However, all the principal rooms in both suites are located on the main floor flush with driveway grade to allow for accessibility for elderly parents now, and the middle aged owners in the future. Bathrooms are designed with aging in place in mind, with curb-less showers, comfort height toilets, and grab bars. This house has ambitious ecological goals, targeting LEED for Homes Platinum and Built Green 5 Star certifications. 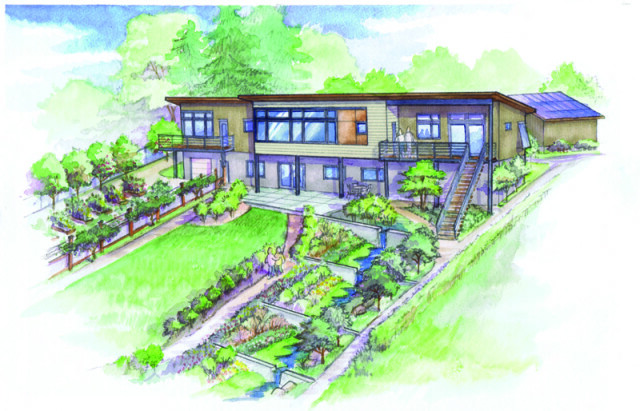 100% of stormwater will be captured and infiltrated on site in a 2200 cubic foot rain garden. Rainwater from the metal roof will be collected in four cisterns in the basement totaling 12,000 gallons. Filtration and UV sterilization will allow the homeowners to use the rainwater for potable purposes in addition to toilet flushing, laundry, and irrigation. This is the first residence in King County to be permitted to drink its rainwater. The project anticipates net zero energy, supplying 100% of its own power with a 17kW photovoltaic array and 30 evacuated solar hot water tubes. The Eastside Harvest House is a truly functional, beautiful, and sustainable addition to the vibrant community of Kirkland. Structural engineer: Harriott Smith Valentine Engineers, Inc. Solar designer: Solterra Systems, Inc.
Surveyor: Pacific Geomatic Services, Inc.
Geotechnical engineer: Geotech Consultants, Inc.
Arborist: Urban Forestry Services, Inc.